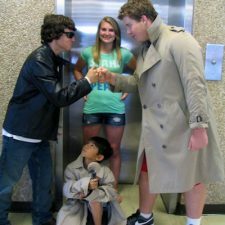 AFF’s Young Filmmakers Program introduces the arts of screenwriting and filmmaking to young people, ages 9-18, and provides them with venues for developing their storytelling talents. The program offers kids opportunities to share their creative work with peers, the public, and professional filmmakers and screenwriters. By introducing young people to the film industry, the program hopes to provide them new mediums to express their creativity, improve their communication skills, and benefit the entire arts community. Austin Film Festival is thrilled to continue our relationship with the Children’s Blood and Cancer Center at Dell Children’s Hospital. Our goal is to bring these young minds to a different place of imagination and creation. All donations raised go to the Children’s Blood and Cancer Center at Dell Children’s and fund the Teen Infusion Room, in the Specialty Pediatrics Building. The Teen Room provides a calming environment to watch movies on the big-screen television, as well as tablets and laptops. It has steadily become a place of comfort for the children while they receive life-saving treatments. 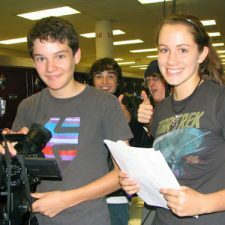 What is the Young Filmmakers Program? Austin Film Festival’s Young Filmmakers Program introduces the arts of screenwriting and filmmaking to young people, ages 9-18, and provides them with venues for developing their storytelling talents. The program offers kids opportunities to share their creative work with peers, the public and professional filmmakers and screenwriters. By introducing young people to the film industry, the program hopes to provide them new mediums to express their creativity, improve their communication skills, and benefit the entire arts community. Digital Storytelling (DS) is an AFF arts education program that improves students’ reading, writing, communication, media technology and idea-expression skills through hands-on screenwriting and filmmaking. Launched in 2005, DS has served over 1,500 AISD students. With a curriculum developed by Austin Film Festival and AISD English teachers, DS has been implemented in high schools where a disproportionate number of the student body are economically disadvantaged and considered at-risk. What is the Arts Education Outreach Scholarship Program? Arts Education Outreach Scholarship grants access to over 300 scholarships for students and teachers in middle and high school. Participants are given the opportunity to attend the Austin Film Festival & Conference, to learn more about the art and business of filmmaking and screenwriting. Specifically designed student panels are held Friday, Saturday, and teacher panels are typically held on Sunday. What is the Young Filmmakers Competition? Austin Film Festival showcases the best youth filmmaking from around the country during its annual Austin Film Festival, October 24 – 31, 2019. The competition is free to enter and open to youth filmmakers ages 13 to 18. The winning filmmaker will be notified prior to the Festival, and will receive two (2) Weekend badges to the Austin Film Festival (for the filmmaker and a legal guardian*), two (2) tickets to the AFF Awards Luncheon (Saturday during the Festival), an AFF Award and reimbursement (up to $500) of one round-trip airfare to Austin to attend the AFF; AFF will put the winner up in one room for two nights’ stay at an AFF host hotel during the Film Festival. Where is summer camp held this year? How early can I drop-off my child? You can drop off your child up to 30 minutes early. How do I drop-off/pick up my child? A valid driver’s license or state issued ID card is required for all pick-ups from either the parent or authorized person. Parents (or authorized person) arriving later than 30 minutes after the completion of a class section will incur a late fee of $10 (30-45 minutes after); and $1 per minute after. What if my child has a license? Students who are 16-18 years old, with a valid driver’s license and vehicle, are not required to wait for parents to sign them out but must sign themselves out before leaving school grounds. Snacks are provided during camp by Whole Foods Market, but if your child requires specific food/beverage, you must provide your own snacks/beverage. Lunch if your child is attending a full day camp. Water bottle (we will provide small water bottles for each child. There are plenty of water fountains located around the school). Sweatshirt or long sleeve shirt (classrooms can get cold). Pencil and paper (for brainstorming and taking notes). What should my child expect at camp? What is the guest speaker series? AFF hosts a series of major Hollywood writers, producers, or directors speaking at camps. All campers are invited to attend every speaking event. Will my child have a chance to show their movie? *Parents will receive an email closer to this event with showcase times, RSVP information and more. What do I need to complete for my child to attend camp/How do I get the Packet? You need to fill out the Summer Camp Packet that will be emailed to you from the Summer Camp Coordinator-this needs to be completed BEFORE the beginning of camp or your child will not be able to attend their class.